Fashion Scout is proud to announce the London based Eponymous brand Tolu Coker, as the winner of the AW19 coveted Merit Award. Created in 2009, the new talent initiative is worth £20,000 across three seasons and has been created to support and develop new designer businesses on a global level. Selected from hundreds of applicants by a judging panel, the youthful urban aesthetic of Tolu Coker, drew attention to from industry experts including Martyn Roberts – Fashion Scout’s Founder and Director, Contanza Lombardi – Next Gen Buyer at Browns, Kendall Robbins – Senior Programme Manager at British Council, Lizzy Bowring – Catwalk Director at WGSN and Scarlett Conlon – Deputy Fashion Editor at The Guardian. Using their expertise, the judging panel gathered in November 2018, spending the day looking through designs and portfolios to establish this seasons Merit Award Winner. Tolu aims to showcase her identity throughout her work by embracing dual heritage and cultures. She does this by reconstructing the black identity within the western world by adding personal prints, embellishments and personal old polaroid photos of her family. Her work is a fusion of generational experiences, with some pieces being inspired from extracts from her Father’s diary. The brand ethos is all about identity. Her previous collections focused on giving social ‘outsiders’ a space within the community by representing their stories and challenging conventional perceptions of power, aesthetic beauty and stereotypes. This development of unique and innovative design techniques, which utilise both traditional artisan craftsmanship and modern technology, is integral to the brand’s conscious consideration for sustainability and the advancement of technology in the forthcoming AW19 collection. Reworked denims, recycled leathers and re-used plastic and lace scraps are paired alongside striking and daring silhouettes, bold illustrative prints/embroideries and a playground of textures to add a youthful, contemporary and luxurious flair to each piece. Black and white feature heavily within the new collection, reflecting her photo inspiration, whilst primary colour pops and brown tones provide contrast. The collection gives a youthful freshness, with many outfits containing being classic casual silhouettes of hoodies and jeans but also with Nigerian tribal head pieces. The brand is a catalyst for acceptance and freedom in fashion, as well as a tool to urge consumers to move towards buying more investment clothing pieces – clothing that is timeless and in its longevity, reducing carbon footprint. She boasts a global client base, with her roster including high-profile names such as Rita Ora, Rihanna, Emily Sande, Demi Lovato, Ms Banks, AJ Tracey and Tiwa Savage. Her work has also been internationally recognised by publications and platforms such as Vogue, Love Magazine, Dazed, Hunger, An0ther, WWD, NME, LVMH teams and even the Tate! Originally from Nigeria, Tolu is a Fashion Designer, Textile Designer and Illustrator and has lived in Spain but currently resides in London. Whilst studying at Central Saint Martins, Tolu undertook several successful stints at Maison Margiela, J.W. 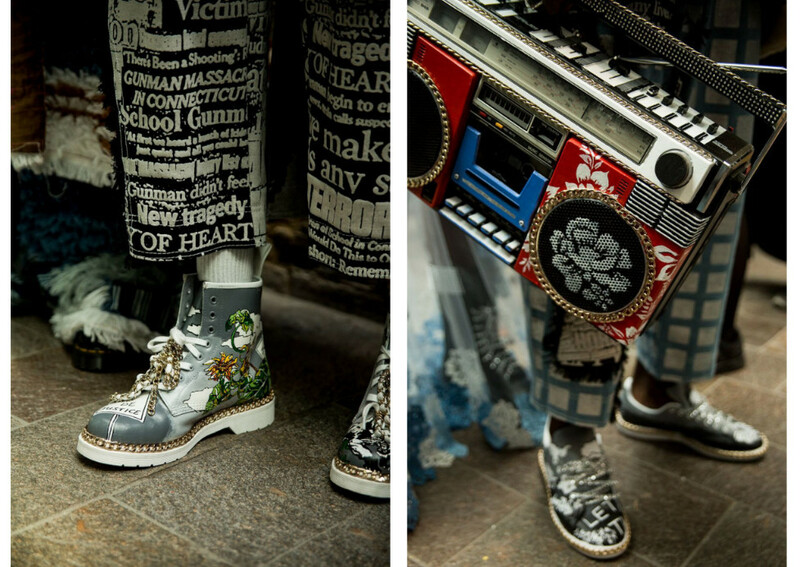 Anderson and Celine and gone on to have many collaborations with established labels such as Dr Martens, Swatch and illy. The young designer was recently shortlisted as a finalist in the ASOS Fashion Discovery 2018, and is a tripleaward winner of the globally-acclaimed ITS 2018, where she took home a hat trick of awards across both Fashion and Artwork categories – The Diesel Award, The Vogue Talents Award and The ITS Time For Coffee Award. Tolu Coker will showcase her AW19 collection at Fashion Scout London on Friday 15th February 2019 at 15.30 during London Fashion Week.